Tamarixia radiata, the parasitic, stingerless wasp used to help control the Asian citrus psyllid. They look like grains of black sand inside a prescription vial. But each speck is a wasp that is lethal to the offspring of the Asian citrus psyllid, an aphid-size bug that spreads the bacteria that cause Huanglongbing, or citrus greening disease. If California’s $1.8-billion citrus industry is to buy enough time to stave off the disease, which has decimated citrus crops in Florida, Mexico and Brazil, those vials may as well be hourglasses. At least nine trees on seven properties in San Gabriel tested positive for the disease this summer, the second outbreak in the state in three years. Crews have been going door-to-door on the streets around Vincent Lugo Park, inspecting trees and spraying them with insecticides. They hope to make a dent in the local population of the bug to keep the bacteria from hitching a ride to other trees in a quarantine area that has swelled to 87 square miles in the San Gabriel Valley. Similar quarantines restricting the movement of citrus fruit and plants are in effect in 17 counties where the psyllid — but not the disease — has been detected. Growers have been applying insecticides in their orchards, but agricultural officials long ago concluded that wider spraying in urban areas far removed from orchards is too costly and is unlikely to stem the psyllid infestation. Instead, David Morgan, a biocontrol specialist with the California Department of Food and Agriculture, raises at least 100,000 Tamarixia radiata every month in his hothouses in Riverside. His crews tap out the tiny wasps from those vials on citrus trees in a 40,000-square-mile area from Imperial County to Santa Barbara. They have released about 2.4 million Tamarixia since 2011. They also have spread a much smaller number of a second parasitic wasp, Diaphorencyrtus aligarhensis. 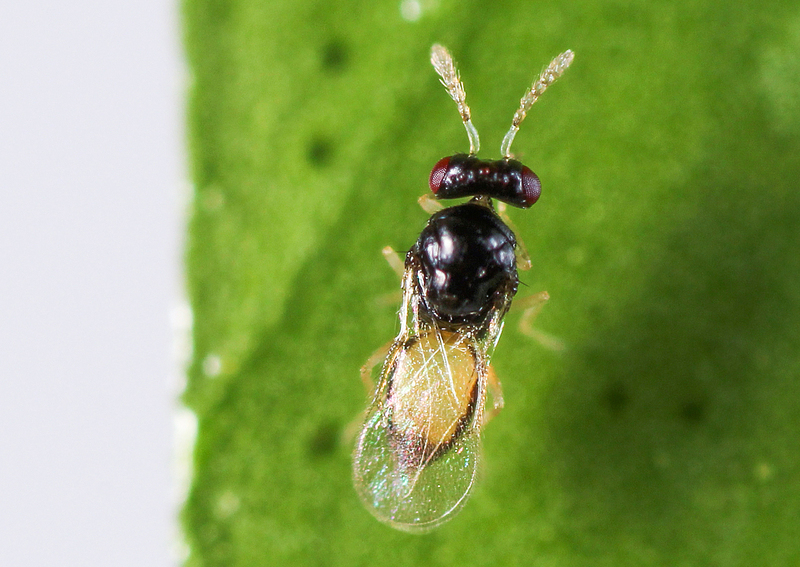 It’s probably best that you can’t see what Tamarixia does to the babies of the citrus psyllid. Female wasps lay their eggs on the undersides of the nymphs, and when the wasps hatch, they burrow into these juvenile psyllids and begin digesting their innards, eventually leaving an empty hull where the wasp can grow to maturity. “It basically squirts out enzymes and slowly digests the host while it’s still alive,” Morgan said. The adult wasps also dine on the nymphs. The densely populated Inland Empire may seem an unlikely place for ground zero of the psyllid infestation. Citrus production, which started here in the 19th century, has long since been swept away by urbanization. But urban populations and their fondness for citrus trees are aiding the spread of the bug and the bacteria it carries, according to researchers and agricultural officials. The disease has not been detected in commercial orchards, largely because California reacted more quickly than Florida, where a decade-long outbreak has cost the industry an estimated $7 billion. In 2009, a year after psyllids were first found near the Mexico border, growers created a voluntarily assessment that raises about $15 million a year for the Citrus Pest and Disease Prevention Program, some of which funds Morgan’s research. The U.S. Department of Agriculture gave the state nearly $9.6 million this year to fight the pest, and supports a related program at UC Riverside that provides Morgan with Tamarixiastock. Even the “mother tree” of California’s famed navel oranges is infested with the psyllid — although it shows no signs of disease. Planted by Eliza Tibbets in 1873, the Brazilian variety launched the state to its lead position in the fresh citrus market. Now shaggy and 17 feet tall, it is fenced off in a pocket park in what is now the heart of Riverside. “There’s actually more citrus in urban areas than there is in production in California,” said Morgan, who confesses to having 40 plants at his Riverside home. A crude survey by UC Riverside researchers — essentially a drive-by of about 670 homes — suggests 40% of urban and suburban residences in the Inland Empire have at least one citrus plant visible from the street. Morgan’s crews release their wasps mainly on trees that are publicly accessible. That would not include the orange tree tucked away behind Iris Malakoff’s garage, a couple blocks from Lugo Park. Other than at harvest, Malakoff hardly gave the tree much attention since planting it a decade ago, she said. “There was just some extra space, so several years ago I put the orange tree there,” she said. Inspectors who are combing every property near Lugo Park sprayed the tree on July 30, she said. “The biggest issue is getting people to know what they have in their backyard, and to not pass it on,” said Gretchen Sterling, who runs a farmers’ market on Thursdays at Lugo Park. Many residents also had no idea that their orange Jessamine is in the same family as citrus and could host the psyllid, said Alfredo Sanchez, a California Department of Food and Agriculture supervisor who was overseeing spray crews near the park. Other lesser-known psyllid hosts include wampee and the Indian curry tree. Although it is relatively easy to find the psyllid on such plants, where it leaves crusty white strands on the tender new growth on which it dines, it is harder to detect the disease itself. Early signs include a mottled, asymmetric yellowing pattern on leaves. Identifying the bacterium behind the disease requires DNA-based laboratory testing, which can be faulty. “The trouble with that test is even though it’s accurate, it’s not very sensitive,” said Mark Hoddle, a UC Riverside agricultural extension specialist and biocontrol researcher. Because the bacteria are not uniformly distributed on the tree, sampling can miss the disease, he said. Hoddle has been working on biological ways to control the psyllid since it first was detected in California counties bordering Mexico, in 2008. His work took him to eastern Pakistan in search of natural predators. “My job is to figure out where the pest came from, go back to that country, see what’s eating it there and see whether there is any potential for those natural enemies to be released in California,” he said. After several years of testing, he found that two of the nine parasites he brought back proved suitable to California’s climate and did not seem to pose a threat to other flora and fauna. Hoddle and Morgan said the wasps alone won’t halt the psyllid. But the effort could buy time for scientists to find ways to cure the disease or prevent the bacteria from propagating. Once a bacterial colony gets hold, it rapidly clogs the system that transports nutrients in the citrus plant, leaving fruit green, misshapen and bitter. This entry was posted in Asian Citrus Psyllid, HLB, Integrated Pest Management (IPM), Invasive Species, Uncategorized. Bookmark the permalink. How do we get these wasps for our back yard? Thank you for your question. General inquiries can be directed to officeofpublicaffairs@cdfa.ca.gov.